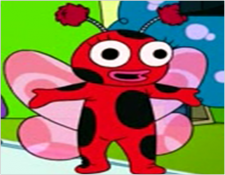 Lady Buggle is a ladybug-like Humpling that lives on the planet Rumbledy-hump. She likes to "huggle all her friends." On the TV show Rumbledy-hump she is portrayed by Leela. Professor Farnsworth says the costume is made out of a walrus skin. It is odd that Lady Buggle has two eyes, though Leela has only one. The real alien has two eyes, and Leela copied her character and look. It is also clear that the people in the costumes can't really see out of the eyes of the costumes, but probably through some invisible hole. Lady Buggle: Oh, hello, Leela. I was just telling the others how we shouldn't eat food off the floor. Should we sing a song about it?